BHRC has signed onto joint oral statement to the Special Rapparteurs on Torture and Human Rights Defenders made at the 37th session of the Human Rights Council in Geneva. The statements were delivered by the International Commission of Jurists (ICJ) on behalf of BHRC, the International Bar Association’s Human Rights Institute (IBAHRI), Union Internationale des Avocats (UIA), Lawyers for Lawyers (L4L), the Law Society of England and Wales, and Lawyer’s Rights Watch Canada (LRWC). The statement drew particular attention to the lack of independence of the Bar Association in Azerbaijan, proposed legislation in Kazakhstan that threatens the independence of the legal profession, and the continued detention of Taner Kilic, a lawyer and president of Amnesty International Turkey. In partnership with the International Bar Association’s Human Rights Institute (IBAHRI), BHRC also signed onto a statement to the Special Rapporteurs that looked more closely at the concern for lawyers and judges in Turkey. In the second statement, BHRC and others raised concern over the widespread use of torture and other ill-treatment in the aftermath of the coup and called for the Rappartours to stop and remedy the arbitrary arrest, detention and wrongful prosecution of legal professionals and to prevent, investigate and punish the use of torture and ill-treatment by state officials. 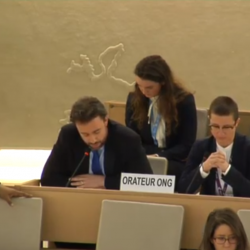 You can read the oral statements by the ICJ on behalf of BHRC and others here. You can read the joint statement with the IBAHRI and others here.